HP Proliant microserver Gen 8 in great used condition Intel G1610T CPU 6Gb RAM 2 X 1Tb Hard Disk ILO 4 Advanced installed. 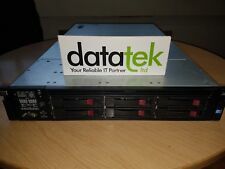 I will include an Intel Pentium G2020 that will fit if the purchaser would like it, This great server is for sale as I have been gifted an ML10 Gen9 Collection in person welcome from Cleobury DY148 Condition is Used. there may be a delay on postage as my partner is about to go in to labour any day, but will be posted ASAP afterwards Dispatched with eBay delivery – Shutl 1 day. HP Proliant Microserver with 2 x 1TB Seagate hardrives. WHAT'S INCLUDED: - Server ONLY. SHELF CODE: N19-1604 16GSJ. WHAT'SNOT INCLUDED: - Standard kettle power lead / Other accessories / Cables / Software / Installation advice etc. SPECIFICATION: - See title for specification. HP Proliant ML110 G7 Server. HP SmartArray P410 RAID card. Xeon Quad Core E3-1220 3.1GHz. 1x160GB 10k Western Digital Raptor drive. Very clean condition. Hp proliant microserver Gen7 N40L 8GB ECC, 250GB SSD OS DRIVE, Modded BIOS, KVM, WHS 2011 License and disc included Condition is Used. HP ProLiant MicroServer HP N36L 8gb Ram. Fully Working Condition is Used, No HDD. 5 x 300GB SAS 10K. tested and working perfectly. 1x AG638B - HP M6412A Fibre Channel Drive Enclosure - No Plastic Ears. 12x AG803B - HP EVA M6412A 450GB 15K Fibre Channel Hard Drive. 1x 356906-001 - HP MSA Rack Rails Kit. And many more. Fibre/SCSI HBA Cards. Condition is Used. HP Proliant Microserver N54L. AMD Turion II 2.2ghz. 2 x 250Gb HD (I installed Ubuntu to get the screenshots). 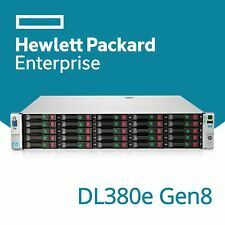 HP Proliant DL360 G7 - Dual Xeon X5650 6-Core 2.67GHz - 64GB - 8x 146GB 6G 15K SAS. Cpu Config – Dual Xeon X5650 6-Core 2.67GHz. Model – Proliant DL360 G7. Hard Drive Format – 8x 146GB 6G 15K SAS. We will respond within 24 working hours. hp proliant microserver gen8. Condition is Used. Collection in person only. Condition is Used. My trusty lab machine. Can be seen running. No longer needed. Collection preferred due to weight and its fragile.